Cook pasta in a large saucepan of boiling water, following packet directions. Drain, refresh in cold water. Combine pasta, corn, peas, capsicum, carrot, and half the cheese in a large bowl. Whisk together the eggs and So Good Lite in a jug and pour over pasta mix. Sprinkle with remaining cheese. Bake at 180°C for 20 minutes, or until golden. Allow to cool for 10 minutes, then turn out onto a cooling rack. Tip: This makes a great lunchbox treat. 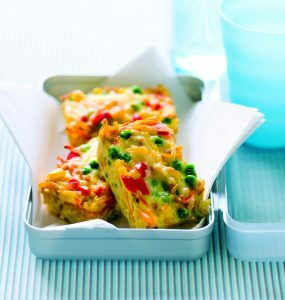 Pop an ice pack in the lunchbox to keep the frittata cool. Recipe and image kindly provided by Sanitarium, visit their website for more delicious recipes.